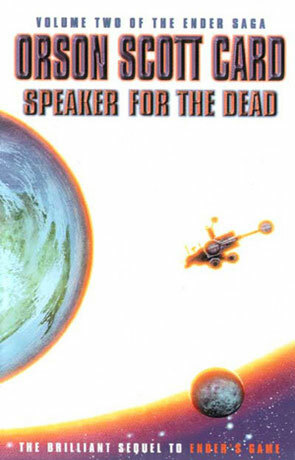 Speaker for the Dead is the second volume in the Ender Saga, by Orson Scott Card and has won the Hugo, Locus and Nebula awards. This book could probably be read on it’s own, but it contains numerous spoilers for Enders Game and I can’t think of any good reasons why you wouldn’t want to read that one. On that note I’ll have to warn you that this review contains spoilers for Enders Game and that you should stop reading this review and go read Enders Game instead if you haven’t already. There is, of course and as always, no spoilers for the book under review. When we left Ender at the end of Ender’s Game, he was working on establishing a human colony on an old bugger world. He had found the Hive Queen egg and was thinking about finding it a home. “Speaker for the Dead” starts of a lot later, the way most people count about three thousand years has passed, but Ender has only aged about twenty-five years due to extensive travelling at close to light speeds. Ender has been travelling from world to world, speaking for the dead, looking for a new home for the Hive Queen and a place that he himself can call home. I love the way Card uses the idea of a speaker for the dead in this story, but I’m severely doubt that the idea of a speaking about the dead, the way Card envisions it, would work in the real world and with everyday people. The idea is that when somebody dies, somebody, a speaker for the dead, does what he (or she) can to find the real truth about this person and then tell it. The good and the bad. The beauty and the beast. The full Monty. In the foreword Card argues that today, at funerals, what is told is mostly the positive side, so that we can cling to these positive things when we remember our dead, thus making it easier to bear the loss. I understand the argument, and it is, in a way, a shame that we in this way truly kill a, small or large, part of the person who we should honour by remembering everything about. My problem with telling the truth and everything, is that your truth isn’t my truth and telling everything would be mighty boring. When we speak about the dead at funerals today, we speak for the living and not for the dead. They can’t hear it anyway and they are not the ones grieving. Anyway, the important ting is that this is a wonderful book. Ender goes to the colony world of Lusitania, to speak for newly a deceased. What he does end up doing is speaking for somebody else and in the process he does a great job of healing one of the most dysfunctional families ever described in science fiction. And this is where Card really shines. Where some authors can have problems just creating a single believable main character for their books, Card goes out and creates a fully populated family, that is fantastic and alien, yet totally believable. All the characters has depth and texture. I haven’t even mentioned the local aliens yet! Small friendly and totally alien. They are even totally friendly about it when they carve up a couple of the scientists who are trying to study them. Better than Enders Game. The only bad thing I can say about this book is that some of the characters speak a bit of Portuguese once in a while and I find that a bit annoying. Oh, and that I’m having a hard time imagining how Card can top this in the book III (Xenocide). Written on 18th April 2002 by TC.